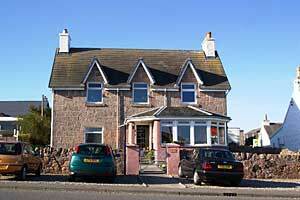 Seaview Bed and Breakfast Accommodation, Isle of Mull. 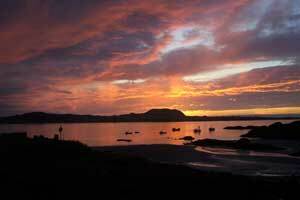 One minute from Iona Ferry. Welcome to the Seaview Bed & Breakfast web site. Here you can see our award winning accommodation and learn about the wonderful scenery, wildlife, history and geology of Mull and its associated islands that make a stay here so memorable. Seaview is an ideal place to stay for exploring, touring, walking and cycling. Whether visit for a short stay or longer holiday or vacation, as a guest at Seaview you will enjoy the spectacular hills, coastline and golden beaches that can be found in the Scottish Hebrides in general and the Ross of Mull in particular. Seaview is a traditional Hebridean home, protected from the Atlantic gales by thick walls of pink granite. 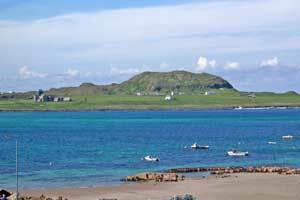 It is the nearest 4 star quality en suite bed & breakfast to the Iona and Staffa ferries. Through the windows, you can gaze for hours upon the white sands of the beach below and across the blue waters of the Sound of Iona to the silhouette of the historic Iona Abbey and Atlantic beyond. On your visit to this site, we hope you will discover a little of what make this area so special. Dream of experiencing the magical islands of the Inner Hebrides: Mull, Iona, Staffa, Treshnish Isles, Erraid, Ulva, Gometra and Inch Kenneth, all with their own unique charm, landscape and history. For those who enjoy wildlife, Mulland its associated islands is one of the best places in Scotland to see an eagle, puffin, otter, red deer or seal. We look forward to helping you get the most from your stay.